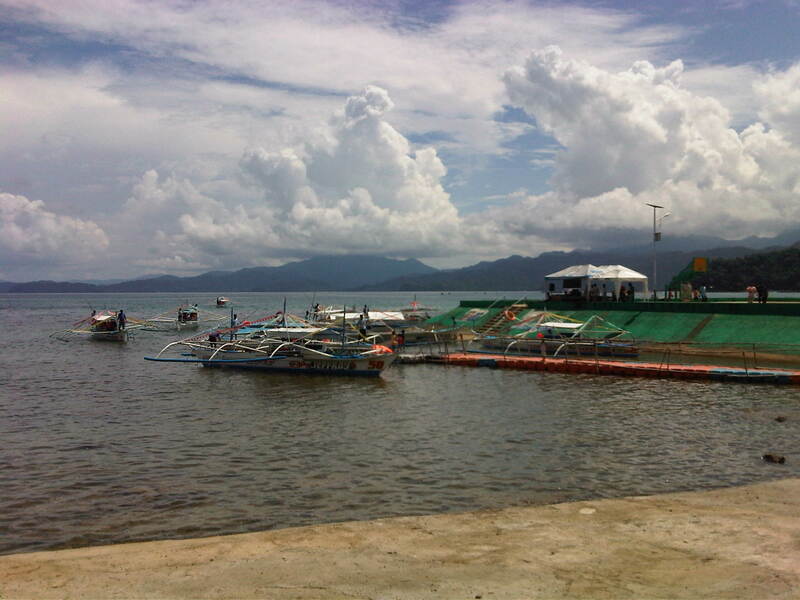 The jump-off point for visitors to the St. Paul Subterranean River (Underground River) is the Sabang Port at the northwest part of Puerto Princesa. Following are photos taken at Sabang including some showing information on transport and procedures for visitors. Map of the national park showing some of its features and the transport services to/from the port. Puerto Princesa limits the number of visitors to the Underground River and there are procedures for visitors and their accredited guides to follow. I caught this scene of children playing football on the sands during low-tide. While most boats seem to be for ferrying tourists to the Subterranean River, there are also many fishing boats at Sabang. Fishermen fixing up their boat likely before going on a sortie. I could imagine Sabang was like other fishing villages in the Philippines until authorities started promoting attractions like the Underground River. The influx of tourists transformed what was probably a sleepy village into a tourist destination complete with commercial developments like resorts, restaurants and shops. Outriggers dot the waters around Sabang Port, their boatmen waiting for their turn to ferry visitors to the Underground River. The concrete pier provides a basic but better facility compared to other similar ports around the country. The dispatching of boats is organised and passengers queue in an orderly manner to board the boats assigned to them. 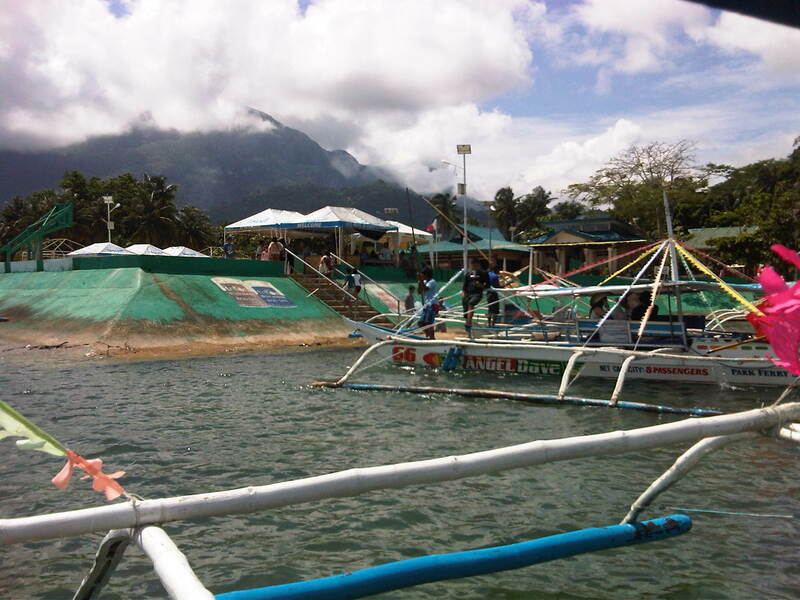 A boat (left) approaches as another (right) just left, bound for the Underground River. Clean restrooms /toilets are a must for tourist destinations. Sayang Port has well-maintained toilets. Tourism office at Sabang Port – note the basketball goal post in the photo? The area is also used for other purposes including sports activities. Also noticeable in the photo are street lamps powered by solar energy. We saw some solar-wind power lamps around Puerto Princesa and Sabang’s main road has these for night-time illumination. A close-up of the small box showing schedule and cost of transport services to/from Sabang from/to Puerto Princesa city proper. Note that there are only 4 trips per day for public transport (bus or jeepney). Boatmen manoeuvre their vessels in the crowded waters of Sabang Port. Another photo of boats lined up at the port. Portable or collapsible sheds or tents at the port often bear the name of the company sponsoring or providing these for port users. Under one, there was a group facilitating the tour of a group of senior citizens from around Puerto Princesa. We got it from our guide that they are given free rides and visits to the Underground River as part of their benefits as senior citizens. Visitors get-off from their boats as other vessels queue to unload their passengers. It takes some skill from boatmen to manoeuvre and make sure they don’t collide with other vessels. Scene of the port and boats from the shop and eatery-lined road along the coast. Advice to tourists: tip your boatmen generously. They serve as your lifeguards and do their best to maintain the boats and the equipment. They don’t get much from ferrying visitors to and from the Underground River and they do have families to feed. Make this tip your contribution to ensuring sustainable tourism in this heritage site that is also considered one of the top natural wonders of the world. Before anything else, I must first state that I have not used Uber in the Philippines nor have I used it elsewhere. Its probably because I have not found a use for it…yet. In cities in other countries that I have traveled to, I often use public transport and cities with good mass transit systems have very high marks for me. There are taxi services in these cities and I have had mixed experiences with taxis in Bangkok and even Singapore. I think Japan’s taxis are excellent and locally, Iloilo’s taxis particularly that of one company should be the model for city taxi services in the country. The services offered by Uber reminds me of the evolution of UV Express or FX services. 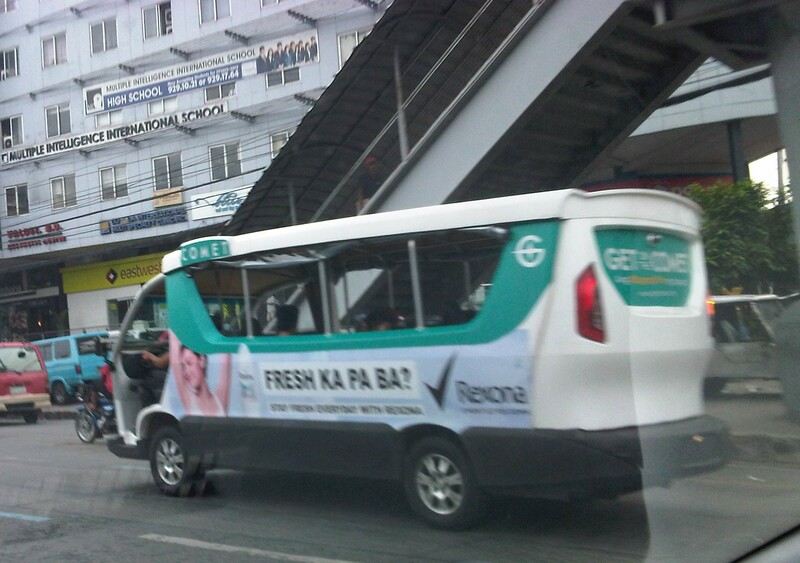 Back in the 1990s, private vehicle owners/drivers saw an opportunity to “earn a few pesos” by offering a ride to people waiting along the road. An AUV driver, for example, bound for Makati from Quezon City would take in a few passengers for an agreed fee and the collection would help him defray costs of fuel as well as of maintenance for a trip that he would likely make alone if he didn’t offer rides to others. He had no coverage for his passengers should they be involved in a crash and they even conspired to claim they were carpooling or were friends if accosted by authorities (i.e., when suspected to be running a colorum vehicle). This is practically the same service offered through Uber. The only difference being that Uber employs an app to facilitate “service contract” between driver and passenger. The app basically makes the agreement discrete and unknown to regulators of transport services. Like the predecessors of UV Express services, Uber service providers serve a segment of commuters who have difficulties getting a public transport ride and are likely also to be frustrated or disgruntled about the poor quality of public transport services. This is not limited to taxi services but encompass bus, jeepney, UV Express, tricycle and rail transport that a majority of commuters regularly take to go to their offices, schools or other destinations. I purposely omitted walking and cycling here as everybody essentially walks and cycling is not really a transport service along the lines of public utility vehicles. Very recently, the Land Transport Franchising and Regulatory Board (LTFRB) ruled that Uber is illegal, basically classifying it as colorum – terminology for vehicles illegally operating as public transport. Is the agency totally wrong about their ruling against Uber? While I haven’t seen the decision or read any memos regarding this, I would assume that the board had its reasons and some of these are reasonable, sound bases for such a memo. For one, regular public transport services require insurance for carrying passengers. Regular insurance taken by private car owners covers the driver and the passengers who ride for free but public transport carry passengers for a fee (fares) and thus drivers and the operators have a bigger responsibility particularly with regard to safety. This question on liability is perhaps the biggest question for Uber and the people behind it. I think this will be a good topic for law schools to take up and perhaps a good subject for debates for and against the service. I haven’t been to Puerto Princesa, Palawan since 2010 so I had wanted to see for myself what improvements they have done to their airport. This was considering the city and the province in general have become a very popular and accessible tourist destination featuring pristine beaches, hidden natural attractions as well as vibrant communities around the island. While the airport has been under renovation for a while, the terminal is already nearing if not already at capacity. Surely, as the country continues to promote tourism, Palawan will have a steady increase in the number of visitors and Puerto Princesa Airport will be the main airport access to the main island. The islands of Coron to the north of Palawan is served by a small airport in Busuanga, and El Nido at the northern part of Palawan Island will soon likely be served by another airport. But the jump off point for most of the island including the relatively “unexplored” south will be Puerto Princesa, which is also the centre of business/commerce. While its runway can handle large planes (I once rode on a B747 from Palawan), its terminal cannot handle the number of passengers such airliners are able to carry. The prospect of direct and regular international flights also would require a larger terminal to efficiently handle both domestic and international arrivals and departures. Passengers walk towards the terminal. Many passengers linger or loiter on the tarmac to take photos of themselves with the airport or aircraft in the background. While not unique to the Philippines, lingering on the tarmac is a no-no in many other airports due to security concerns. Air Asia recently acquired local budget airlines Zest Air and now services Zest’s domestic destinations like Puerto Princesa. Bags being transported from the aircraft to the baggage claim area. Bags are loaded and unloaded manually so handling can be an issue and a concern especially for those using designer or expensive luggage. On days with inclement weather, luggage can get wet and there is the occasional bags being dropped (and damaged). The baggage claim area at Puerto Princesa airport is obviously not so spacious with just a single belt shared by arriving passengers from different flights. Crowded but not chaotic. That’s how I would describe the baggage claim area when two flights arrived one almost immediately after the other. Sign informing visitors about the policy for going to the Underground River, one of the most popular if not the top attraction in Puerto Princesa. Covered area for loading/unloading passengers and visitors at the airport. Waiting area for people fetching passengers just outside the arrival area. Notices for passengers and others entering the airport driveway. Another look at the loading/unloading/waiting area just outside the terminal building. Airport terminal driveway and departure unloading area. Departure area under construction/renovation with seats, counters and other materials everywhere. Cebu Pacific check-in counters. Tiger Air flights are operated by Cebu Pacific. Air Asia Zest check-in counters. Entrance to the pre-departure lounge/area. Self service check-in machine by Cebu Pacific. This is very useful for passengers arriving early at the airport for their flights. It allows you to check-in, select seats and get your boarding passes prior to the counters opening for passengers checking-in at the terminal. It’s basically an internet or online check-in so you can go to the internet check-in counter, which usually has a shorter queue. Passengers accumulating in near the Cebu Pacific check-in counters. I think airlines shouldn’t have policies preventing passengers arriving early from checking-in. This might be okay for large terminals servicing so many flights but for smaller airports like PPS, Cebu Pacific would probably do better by attending to passengers. Everyone could see that their staff were not at all doing anything behind the counters so they might as well check in passengers so as to reduce and better manage the queuing later on. The airport now services international flights but mostly chartered ones. There is an international departure area and a simple immigration counter. These don’t look like they are in regular use. Pre-departure area at the terminal – there seems to be a lot of seats but these are all practically occupied for a single flight. Most aircraft servicing the MNL-PPS route are not wide bodied but the area cannot accommodate 2 plane loads (assuming A319 or A320) of passengers. This is a non-smoking area by law and there is a room for smokers. People though seem to be in-and-out of the room so people seated near the door leading to the smoking room (there are 2 doors) still get a sniff of cigarette smoke. Overall, the terminal is clean and orderly. There are 3 gates reserved for each of the airlines (Cebu Pacific, Philippine Airlines and Air Asia Zest) that have the most flights to and from Puerto Princesa. Our Cebu Pacific plane was again late by an hour and so that meant we were getting home later in the night. The good thing about it was that it also meant less traffic (both the airport and roads) in Manila compared to a late afternoon arrival. COMET – just another jitney? The COMET (City Optimized Managed Electric Transport) is a 20-seater vehicle designed along the lines of the jeepneys operating along many streets in Philippine cities and towns. More information on the vehicle, its operations and the organisation behind it may be found in their website. The COMET has been in experimental operation for a few weeks now but has been a rare sighting considering only 20 units are operating along a relatively long route that happens to be have congested sections depending on the time of day (e.g., Katipunan Ave. can be very congested during the day and Congressional Ave. is not necessarily a free flowing corridor given jeepney and tricycle operations along the road). A good feature of the COMET is the GETPass, which is a card that is used to pay for fares. The card is something that should have been available many years ago and for use in most if not all transport modes (LRT, bus, jeepney, taxi, etc.). At present, it can be reloaded via COMET staff who are assigned to each vehicle or stationed at the designated stops. They help promote the transport as they sell the tap cards to passengers and other potential users of the mode. Here are photos showing the GETPass and the brochure that comes with it. The GETPass card comes with a brochure on the COMET and how to use the card. Basic information on the GETPass card. Illustrative example of how to use the card. Instructions at the back of the card. More information on Global Electric Transport. Southbound designated stops for the COMET. Northbound designated stops for the COMET. Route map included with the tap card brochure. COMET in operation along the southbound side of Katipunan Avenue (C-5). The current experimental route of the COMET overlaps with several jeepney routes including Katipunan and Tandang Sora jeepneys. If the objective is simply to demonstrate vehicle performance (and reliability) using this route and with actual traffic conditions, then this would be a very fruitful exercise. However, more suitable routes should be considered for the COMET including possibly new routes like missionary routes or feeder routes that are not yet served by any formal public transport. This is one way for the COMET to be mainstreamed and for the low emission vehicle to have a significant impact on transport and environment. Another way that would certainly be the more challenging one is the prospect of the vehicle replacing conventional jeepneys along established routes. I say this is a challenge because there has been a need to retire or phase out conventional jeepneys in favor of higher capacity modes (i.e., bus) and the jeepney sector (operators and drivers) have always been somewhat averse to proposals modernizing jeepneys due in part to financial implications of transitioning to low emission options like the e-jeepney or the COMET. If these are not considered, the COMET will just be an additional vehicle along Metro Manila’s streets, contributing to the chaotic road public transport, and its hyped benefits will not be realised. I do hope that the COMET will not be just another paratransit mode that is integrated with all the other land transport modes currently in operation throughout the country. I believe there is a big potential for the vehicle and similar other models like it for cities and towns that are not yet as highly urbanized as Metro Manila or perhaps Cebu. There are corridors or areas where buses are not or will not be viable within the foreseeable future (next 5 to 10 years?) given the demand for this period. These are where jeepneys thrive (assuming tricycle operations are restricted or strictly regulated) and where the COMET would be most suitable. How Not To Measure Traffic Congestion—Hold the Hyperbole, Please! which appears on Planetizen today, October 15, 2014. Rethinking the economics of traffic congestion which appeared on June 1, 2012. Reading these articles will probably make you think that traffic is good or that congestion is good. While congestion is indeed indicative of economic vibrance as movement of people and goods are a good measure for economic activity, excessive congestion results in many other problems that need to be addressed and which can also be quantified in economic terms. Note, too, that one author mentions “peak traffic” that is now becoming common in developed countries as motorization has plateaued and transport systems have become developed to provide people and goods with a variety of modes to choose from including walking and cycling. In our case, traffic has not yet “peaked” in the sense that motorization continues for many of our cities including Metro Manila. There is also a lag in the provision of transport infrastructure including mass transit systems that should have been constructed decades if not years ago. Perhaps we need to be clear about the context by which congestion costs are estimated and presented. The somewhat dramatic presentations like the manner shown in the first article above reminds us of similar estimates of congestion costs in the Philippines, particularly for Metro Manila. The latest of these come from a JICA project that had as an objective the drafting of a roadmap for transport in the expanded region that is dubbed as Mega Manila (Region 3, National Capital Region and Region 4A). The end product has been billed as a “Dream Plan for Mega Manila” and draws on congestion cost estimates that would definitely be regarded as exaggerated if seen in the context of the two articles we mentioned above. Perhaps it is the important message (i.e., we need to build transport infrastructure) of such exaggerated presentations that we should focus on an not really the specific numbers being quoted by news organizations and circulated in social media. We have to caution the reader that congestion is here to stay and cannot be totally eliminated, especially with economically vibrant or growing cities. What we probably would like to address, however, is excessive congestion. Yes, there is such a thing as excessive congestion. I would like to describe this as something that is “unreasonable” along the lines of say instead of your regular 1 hour commute, it took you 2 hours or more. For some, this can be due to horrendous traffic jams due to flooded streets. Or perhaps someone who takes public transport waiting for hours just to get a ride. And so people are forced to cope and in a way, their minds have been conditioned to tolerate (accept?) the levels of congestion they experience on a daily basis. Congestion is good but it does not have to be hellish. 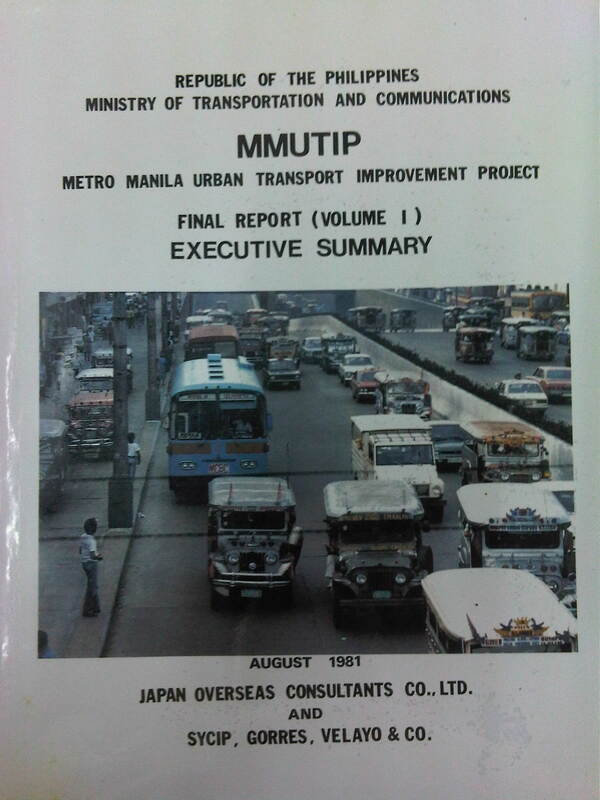 We continue with our historical features on transport with the Metro Manila Urban Transport Improvement Project (MMUTIP). MMUTIP was implemented from July 1980 to August 1981 with funding from the Overseas Economic Cooperation Fund (OECF) of Japan. MMUTIP recommended for a new franchising system to be adopted by the then Board of Transportation (BOT), with standards covering citizenship, route opening, operating performance and financial capability. It also called for the adoption of measures that will safeguard the integrity of franchise records and the speedy processing and better control of franchise applications. The BOT is the precursor of the Land Transportation Franchising and Regulatory Board (LTFRB). Additional bus routes were identified by the study and recommended for 5,900 units for daily operations. The study estimated that as much as 1,870 additional units were required for Metro Manila. Meanwhile, the study found the operations of the Metro Manila Transit Corporation (MMTC), the government owned bus company, unprofitable and stated that the government-run company has failed to define objectives and policies particularly in specifying the extent to which MMTC will render public service at the sacrifice of profit (note that MMTC was losing money in part because it was serving missionary routes so as to reduce direct competition with the private companies). I think looking back now, this was perhaps the beginning of the end for MMTC. Some people say that we could probably have used something like the MMTC today to keep public transport operators honest in their operations and also to continue providing services for missionary routes rather than letting these be served by tricycles and jeepneys that will eventually would have to be granted franchises. As it is, such situations often lead to poorly planned transport services including the (mis)determination of the number of PUV units required to serve an area or corridor. MMUTIP recommended for the control of entry and operation of jeepneys along major bus routes while at the same time calling for a deregulation of entry and operations outside major thoroughfares, which were served or are more suitable for buses. Further, the study called for encouraging tricycle services where bus and jeepney routes are scarce while also stating that these should be limited to local or feeder services. Then as now, tricycles are restricted from national roads.